We are lay devotees of Padre Pio. Our goal is to spread his life, work and teachings through "Daily Thoughts of Padre Pio", prayers, books, etc. 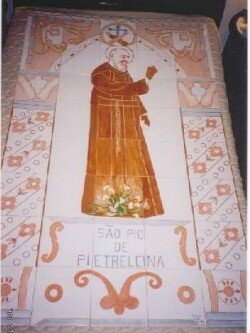 Padre Pio's devotion was passed to us by our parents who were fortunate to meet Padre Pio in person and were his spiritual children (in San Giovanni Rotondo, Italy, where Padre Pio lived). We are a virtual group, therefore it is not possible to visit us. Due to the nature of our work, we do not have availability to participate in any event. We do not advertise any events, Masses, meetings, reunions, etc. If you need any kind of spiritual direction, do not write to us. Look for a priest in your parish (the closest church to your home or to where you are). It is strictly prohibited that any part of these texts be reproduced, stored in a retrieval system, or transmitted in any form, or by any means, electronic, mechanical, photocopying, or otherwise, without the prior written permission of padrepiogroup.org, except if the source is mentioned. This service and these sites are provided by private funds; none of its content can be used for commercial purposes.